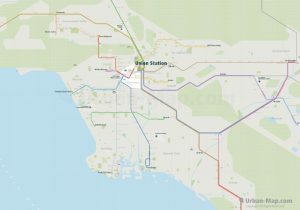 Los Angeles Rail Map - A Smart City Guide Map, Even Offline! The Los Angeles Rail Map is a train route city map that includes all Lines, Routes and Stations of Metro, MetroBus, Waterfront RedCar, Metrolink 91/Perris Valley Line, Antelope Valley Line, Inland Empire-Orange County Line, Orange County Line, Riverside Line, San Bernardino Line, Ventura County Line, Sprinter Line, Coaster Line and Amtrak Pacific Surfliner, Southwest Chief, Sunset Limited and Airport Link in the transport network of the city. 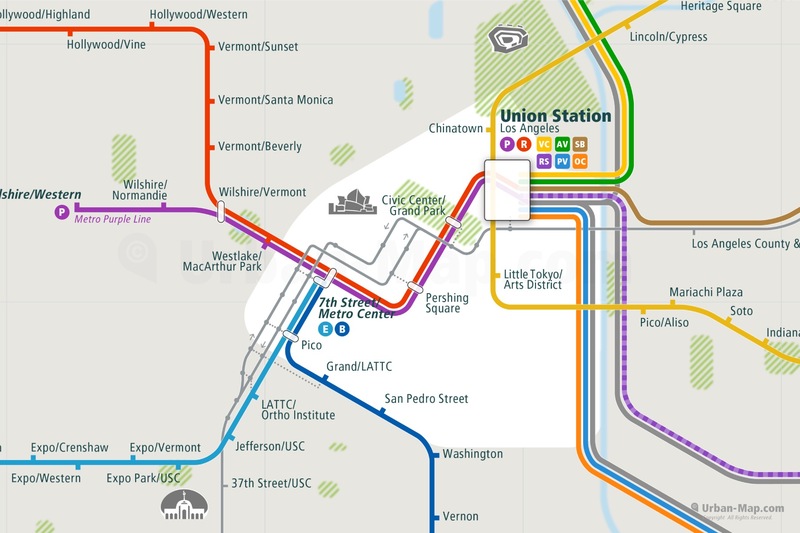 Download the full Los Angeles Rail Map on App Store & Google Play. 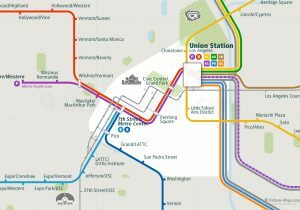 Let the Los Angeles Rail Map show you the way where to go, where to stay and how to get there! Los Angeles, a metropolis consisting of nearly 20 million people and a dozen cities, is located on the Pacific Ocean and is surrounded by high mountain ranges. The weather is mostly sunny and warm to hot with a dry climate. Your clothes should be light and casual. A hat and sunglasses are recommended. The most common way to reach Los Angeles is by airplane. The Los Angeles International Airport is the biggest airport, but other airports also include theb Ontario International Airport to the east, Long Beach and John Wayne Airport to the south and in the north Hollywood Burbank Airport. From LA Airport to Downtown by Metro and Bus the travel time is about 1 hour. Los Angeles is well connected to › San Francisco, › New York, › Chicago, › Seattle and › Mexico City. By Metro, Metro-Bus and train you easily reach most travel destinations within the city. Union Station is the hub where the trains, metro and bus connect. The Metro, a transportation system of subway, light rail and bus transit rapid system, provide a comfortable public transport system from early morning to midnight. But in Los Angeles it is usual to hire a car or to use Taxi. You can find taxis next to the train station and to pay with credit-cards is normal. You should give 10% tip on top of the taxi fare. The best places to stay for business are Downtown and Westside. For vacation and family activities near the coast will be a better choice. For hiking and outdoor activities, you will find a good places near the mountains. In the southern neighborhoods are great to live and well to have a residence. You can also find many hostels in Santa Monica or Anaheim. English and Spanish are the common language. The people of the city, known as “Angelinos”, call their city “L.A., the City of Angels or La-La Land”. Below you can get a glimpse of the Los Angeles Rail Map. The full version of the map, including all main transportation routes and lines on rail and partly also bus and ferry. Special clearly marked stations, transfer hubs and interchanges for line transfer, as well as station names and landmarks represented. 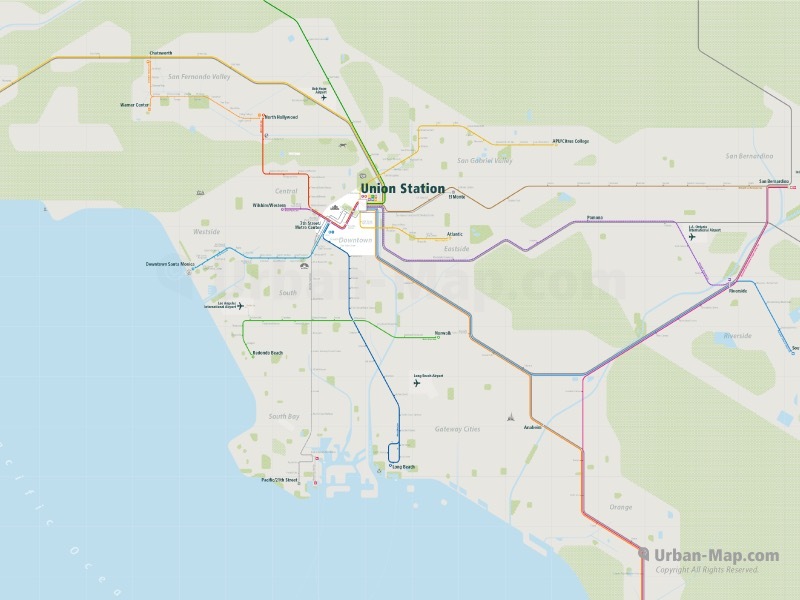 The Los Angeles Rail Map can be loaded in the › City Rail Map app.